This is a scalable context timeline. 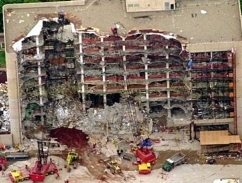 It contains events related to the event September 7-8, 1996: Press Learns FBI Found Map of Oklahoma City Bomb Site on Accused Conspirator’s Property. You can narrow or broaden the context of this timeline by adjusting the zoom level. The lower the scale, the more relevant the items on average will be, while the higher the scale, the less relevant the items, on average, will be. Rents Room - McVeigh then rents a room at a local motel, in which he will stay until he makes his final trip to Oklahoma City to deliver the bomb (see April 13-14, 1995).